But like so many before me, I went crawling back to a previous love, an old flame who didn’t care that I had been paying no attention – and The Dollop welcomed me back with open arms. Happily – the show relies on very few inside running jokes (which can’t be said for all podcasts) and you can basically pick up at any point across the 163 episodes (so far) and tune in without missing a beat. 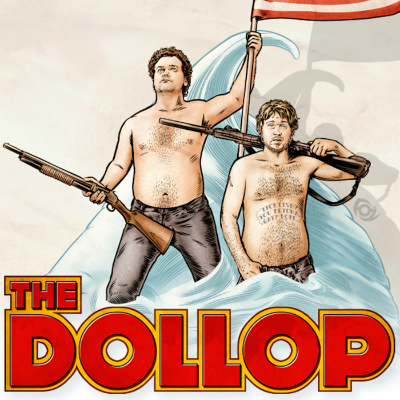 The Dollop is a weekly podcast, hosted by two Americans named Dave Anthony and Gareth “Gary” Reynolds. (“Gary” is one of the running jokes that you will need to listen from early on to understand). Dave is an American stand up comedian, writer, actor, and (obviously) podcaster. He acts on the TV show Maron (yes, that Maron), and has appeared in shows like Arrested Development and The Office. He’s also performed stand up on Kimmel, The Late Late Show, and Comedy Central. He’s an accomplished comedian and a very funny man – named one of the “Comedy Acts to Watch” by LA Weekly last year. For me, though, the highlight of this podcast is Reynolds. Not to be dismissive of Anthony, because he’s great – but in this podcast, he does pretty much sacrifice his funny side for the sake of the story, and provides most of the set ups for the jokes, which Reynolds absolutely smashes out of the park. He has a lightning quick wit, has TV credits like The Real Wedding Crashers and Mancations, has written for MTV and was once told by a Russian hypnotist that he has “an incredible ability to heal animals”. Each week, Dave brings a topic or person from American history, and tells the story to Gareth, who has no prior knowledge of the story. Dave delivers the story in a mostly straight manner, and Gareth inserts the funnies as he sees fit. And he has plenty to work with – topics have included Oofty Goofty (or the Wildman of Borneo if you will), the Kentucky Meat Shower (a favourite of mine), The Stomachmen, and more recently they have investigated such intriguing topics as Syphilis in America and America’s Greatest Sack of Flour. The guys sporadically have guest hosts – Patten Oswalt has made an appearance, as have Australians Justin Hamilton and Wil Anderson, but I feel the show is at its best when it is just Anthony and Reynolds. They have an undeniably brilliant chemistry, superb comedic timing, and they bounce off each other at a rapid pace. You will find yourself equal parts amused and amazed, as the often-incredulous stories have you (and Gareth) laughing uncontrollably in disbelief. Rating? Nah, I don’t do that. Just listen to it. You’ll thank me. The Dollop is a weekly podcast, hosted by two Americans named Dave Anthony and Gareth “Gary” Reynolds. (“Gary” is one of the running jokes that you will need to listen from early on to understand).